As a seasoned sales rep helping restaurant operators put their best tabletop forward, you’ve likely heard the same excuses time and again from restaurant clients reluctant to upgrade their tableware. Many operators mistakenly think doing so is either too expensive or not a critical factor to their overall success. We get it. Battle-wounded chain operators are fighting through the toughest year for restaurant sales since the recession, which doesn’t exactly make your job as a sales rep a walk down Easy Street. But there you are, staring at dingy, chipped, cracked, or just plain tired tableware and you know it’s time for an upgrade – or even to simply replenish existing dinnerware with clean, bright plates from the same collection your clients are already using. So how do you move the conversation forward when you know it’s time for an upgrade but your client doesn’t see the light? We’ve put together a few tips to help you guide your clients through the decision-making process and gain an understanding of how their tabletop is a fundamental component of their operation’s success. What's Their Plan to Stand Out from the Competition? If they say they’re not sure how to differentiate themselves, then they likely don’t realize how much a tableware upgrade can do for their operation. We know that you know that, so if the conversation leads you here, the door’s open to helping them grow their business. 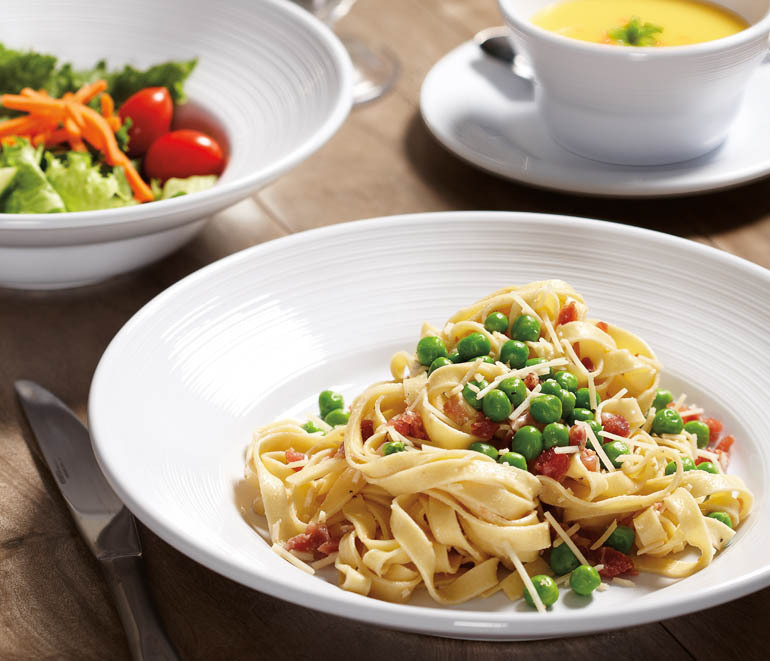 Featured: White melamine bowl with textured rim from Minski collection. Request sample. If they think it’s through better food only, they’re in for a rude awakening. Industry traffic has fallen in 23 of the past 24 months, according to the MillerPulse index – despite low unemployment, a booming stock market, rising home values and a growing economy. This suggests that industry supply has outpaced demand. Diners have too many options to tolerate mediocre experiences. Because everybody is in a scrimmage for the same share-of-stomach, the only way your client wins is by creating share-stealing experiences, which means looking for opportunities beyond the food. Upgrading their plateware may represent an easier path than reworking menu options or ingredients. And an on-trend tabletop can instantly improve the overall atmosphere of a restaurant. A third-party study revealed that customers don’t care whether their plateware is made from china or melamine. What they do care about is that their plates are clean, bright, and free from chips and cracks. In fact, those are the most important attributes your client’s guests are looking for in their plateware. 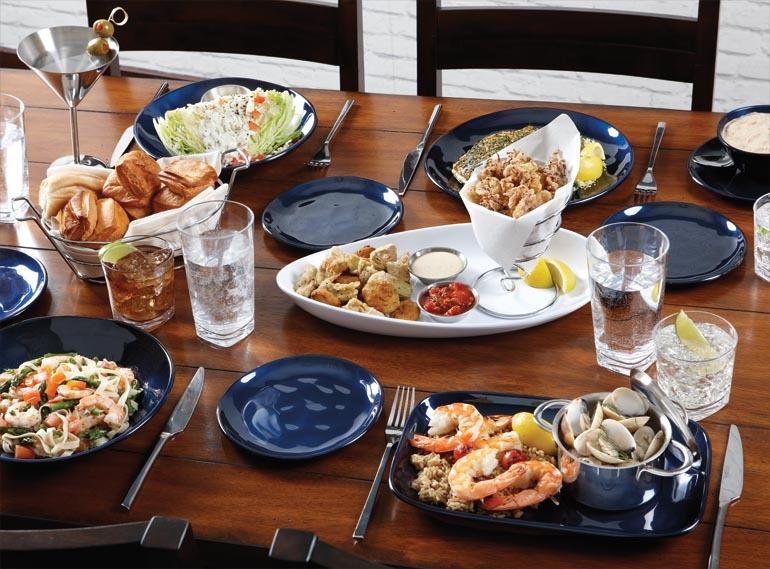 Featured: Blue melamine plates and bowls from Cosmo collection. White melamine serving platter from Osslo collection. Request sample. When was the Last Time Your Client Replenished Their Plateware? Melamine’s natural break-resistant qualities have tempted many an operator to keep it around a little longer than they should. But just because a plate isn’t broken doesn’t mean it’s smart to keep it in rotation. When operators hold on to their plates after they've chipped, cracked, or faded, they’re not meeting their guests’ expectations. Like any plateware, melamine will eventually show knife marks, fade, chip, or crack. And if your clients let that happen, even if they’re serving the best pasta in the universe, their aged plateware will deter guests from coming back. Your clients should be replacing 10%-20% of their melamine plates every year due to occassional chipping and cracking (for perspective, china is replaced at 50%-150% every year for the same reasons). If they don't regularly take inventory of their plateware, have a conversation about building in quarterly inspections to ensure the plates in rotation still look their best. Long-term savings from melamine's low replacement rates will save your clients exponentially more money than china. Help your clients understand that letting their plateware retire before it loses its luster is paramount to creating a share-stealing experience. If they don't, they put themselves in the position of possibly forfeiting repeat business to their competitors. So, what happens if a four-top isn’t smitten with their dining experience? Let’s explore this scenario. How Much Does it Cost to Lose a Guest? This is a great follow-up question after discussing the competitive landscape and plateware replenishment. Your clients may know how much it costs to lose an employee (hint: estimates vary, but it’s not cheap), but do they have an idea of what happens when they lose a guest? Let’s take a look at how much it could cost one of your clients when a four-top doesn’t have a reason to return. Keep in mind the guests’ experience doesn’t have to be bad, per se. But with an overcrowded marketplace, any less-than-stellar experience is reason enough not to come back. One unimpressed four-top can cost your client $3,750 a year. And that’s assuming they only tell four people each. But we all know with today’s social media that not-great experiences are likely to reach a far wider audience. Restaurants that don’t satisfy customers lose them quickly. The current market allows such little wiggle room for serving up anything but a share-stealing experience, and that includes maintaining tableware. Help your clients understand that attention to detail through little upgrades here and there can be affordable, easy, and create engaging dining experiences. We’ve got three excellent examples you can share with your clients. 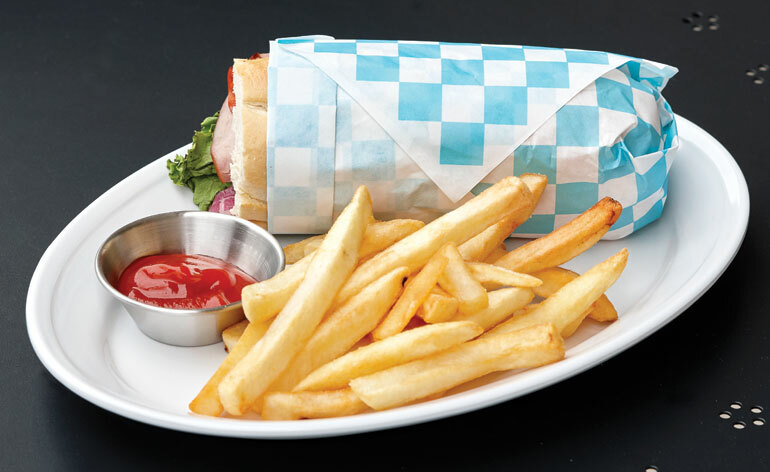 Featured: White melamine plate, blue grease-resistant food-safe sandwich wrap, 2 oz. sauce cup. Request sample. Show them the new, unique styles for food-safe basket liners and sandwich wraps on the market. With on-trend options like typography, colorful checkers, newsprint, and even a vintage burlap design, they can get a custom look without a custom price. Splashy food-safe paper not only helps set your clients apart from their competitors, it helps their photos pop on social media when their guests inevitably post them. All they’re doing is switching one kind of paper for another, so there aren’t any major operational changes. It’s truly a one-for-one swap that will breathe new life into their presentations. Featured: [Left] Stackable fry cone, 7" x 7" Honolulu Newsprint Food-Safe Double-Open Bag, 2.25" Ramekin Holder, 1.5 oz. Ramekin. 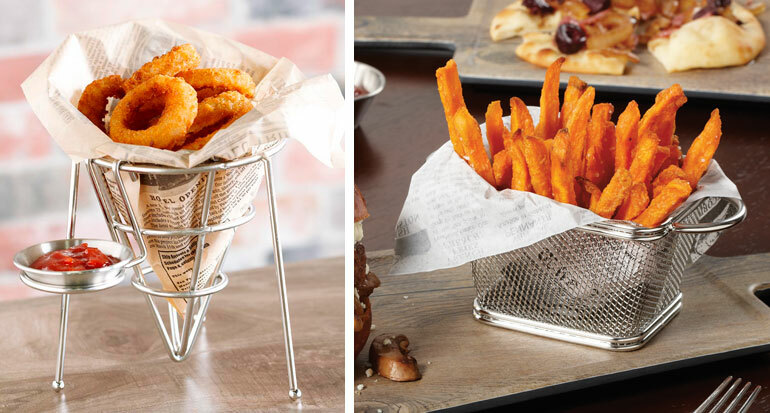 [Right] Single-serving fry basket with round handles, double-open food-safe basket liner in newsprint. Request sample. If your clients are already using food-safe paper liners or sandwich wraps, there’s a good chance some of that paper is being used to serve fried sides. But piling onion rings, French fries, or tater tots onto a plate is not fun, new, or exciting because so many restaurants serve these items the same, tired way. Suggest using delightfully designed cups, cones, or baskets to serve fried sides instead. They offer an unexpected touch to the presentation, organize the space on the plate, and can greatly help with portioning to keep food costs on track. Your clients only need to add a single vessel to achieve a more engaging look. And if they want to go in this direction, let them know they can get double the upgrade just by using trendy food-safe paper designs along with their new and sassy fried sides presentation. These little guys are so neat and absolutely perfect for serving hot side dishes like loaded mashed potatoes, mac ‘n cheese, lentils, Brussels sprouts, etc. Your clients should definitely know about them if they’re interested in small, affordable improvements. Featured: Heiss mini cast aluminum for hot side dishes in red and black. Order sample. 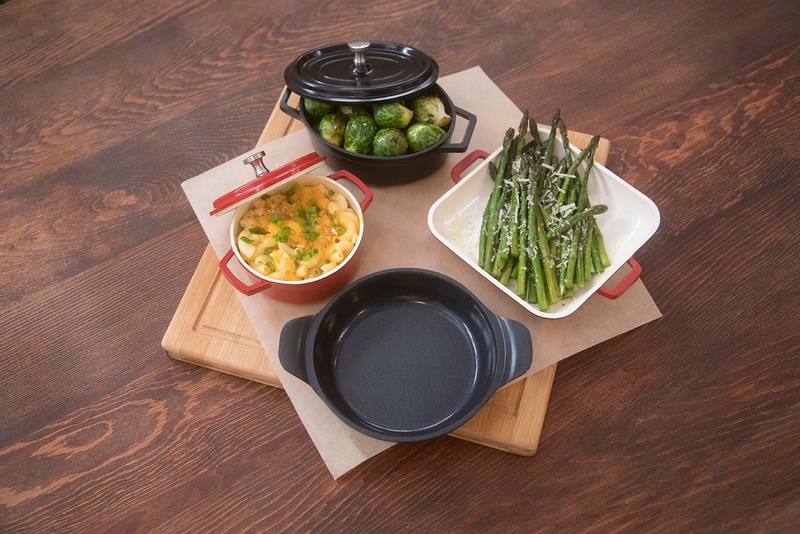 They mimic the timeless look of enameled cast iron, but because they’re made from cast aluminum, your clients benefit from this sought-after style for about 3 times less than cast iron. These vessels are as light as a feather, too, so your clients can easily fold them into their presentations without worrying about extra weight bogging down their employees. PRO TIP: Your clients can use these adorable vessels to add tableside service. Some pieces in the collection include lids, which servers can remove in front of the guest. The aromatic steam from the hot side dish will engage guests, connecting them to their dining experience in a completely new and unexpected way (have you ever had a similar experience?). And how easy is it to remove a lid? Between the challenging competitive landscape, the cost of losing a guest, and several options for new, easy, and affordable tabletop upgrades, you should be able to craft an effective argument to help your clients understand how critical dinnerware is to their overall success. You know when your client needs to upgrade. Isn’t time to put some samples in their hands, have a conversation about why it’s important to keep their image up, and show them some easy, affordable, and small changes that can help them shine so bright their guests won’t even see the competition?